Don't miss Physical Forces, a K-9 Rescue novel from D. D. Ayres! I enjoyed this one! It's a bit different and slightly silly at times but it was very entertaining. Macayla Burkett is working as a pet detective. What exactly is a pet detective you ask? She spends her days looking for lost pets and returning them to their owners. While searching for missing greyhounds, she witnesses a violent incident. She doesn't realize how much trouble she's stumbled upon until she finds herself as a target. Oliver Kelly is a world renowned SAR specialist. When he first sees Macayla digging through the dumpster he assumes she's hungry and offers to buy her breakfast. The reality is she's trying to coax a pup out into the open. Macayla takes one look at Oliver and assumes he's a male stripper. And this is how their fun and crazy relationship starts. It's all fun until they both realize that Macayla is in danger. I have to admit being from Tampa it was fun reading about all the places around the area. Still the story itself was entertaining and I would recommend this one. 'PHYSICAL FORCES' by D.D. 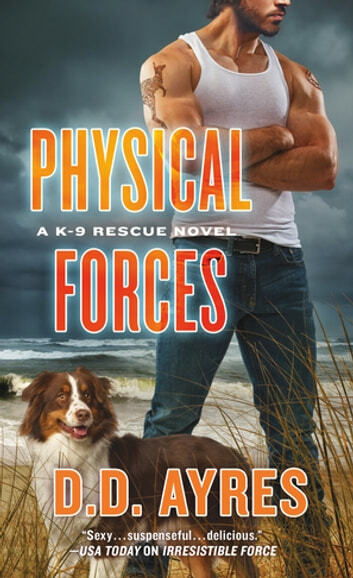 Ayres is book Six in the "K-9 Rescue" series. This is the story of Macayla 'Mac' Burkett and Oliver Kelly. I have not yet read the other books in this series so for me it was a standalone book . Mac does Pet Detective work which now has landed her in some serious trouble after one of her cases lead to a bigger crime. Oliver is part owner of a K-9 Search and Rescue business. They get off to a rocky start it seems but they end up help each other solve what has been going with the animals. I have never read a Dog Detective Romance Before and this one had a little bit of everything in it. We had the Hot Hero, the strong heroine, some funny scene and of course the animals. Overall Great Read! "My honest review is for a special copy I voluntarily read." People retrieval or pet retrieval? Great book - the villain is totally unexpected and there are a number of red herrings. Two great main characters and a lovely rounding out of a storyline from a previous book. Thanks for the YouTube referral!